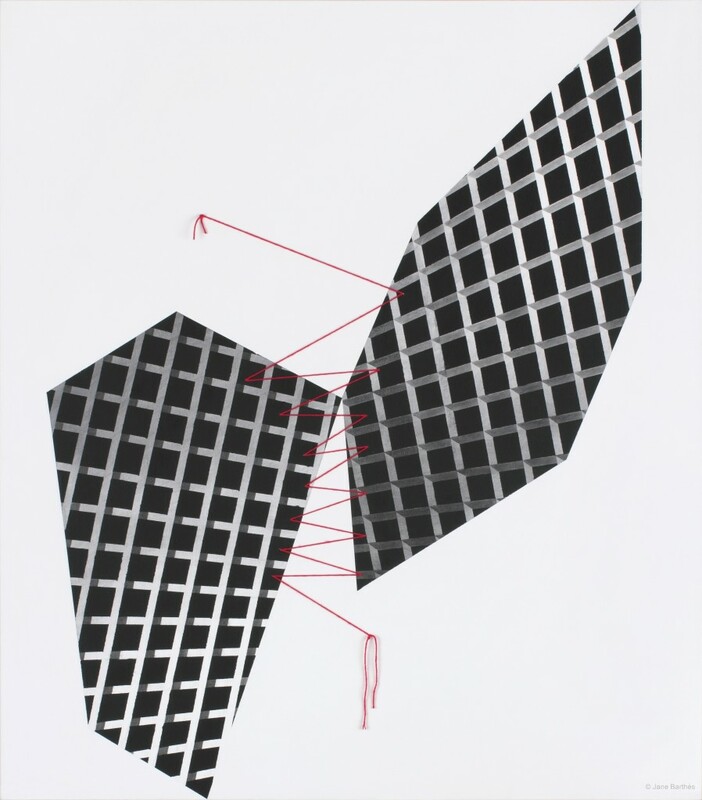 Team Armadillo is excited to announce that we’re working with US based artist Jane Barthès. 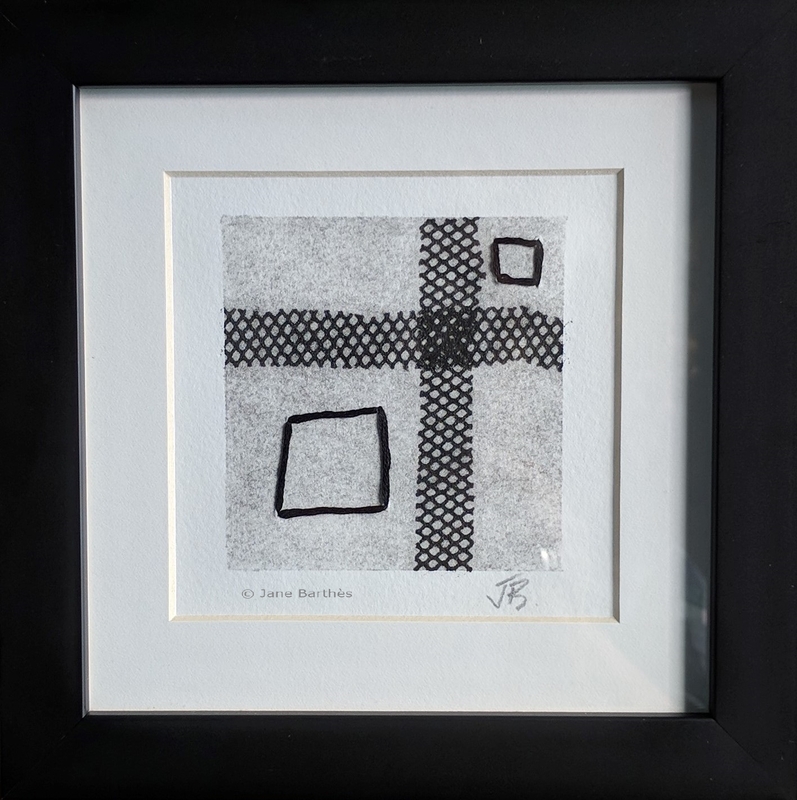 Among other activities we’re promoting her stitched monotype prints in the UK and Europe. The first batch has arrived, hot off the press! Jane Barthès’ art grapples with the concept of relationships between all things; the ebb and flow of matter and energy, the intersections of chaos and order; and the human struggle to find clarity and create harmony in a world filled with uncertainty. 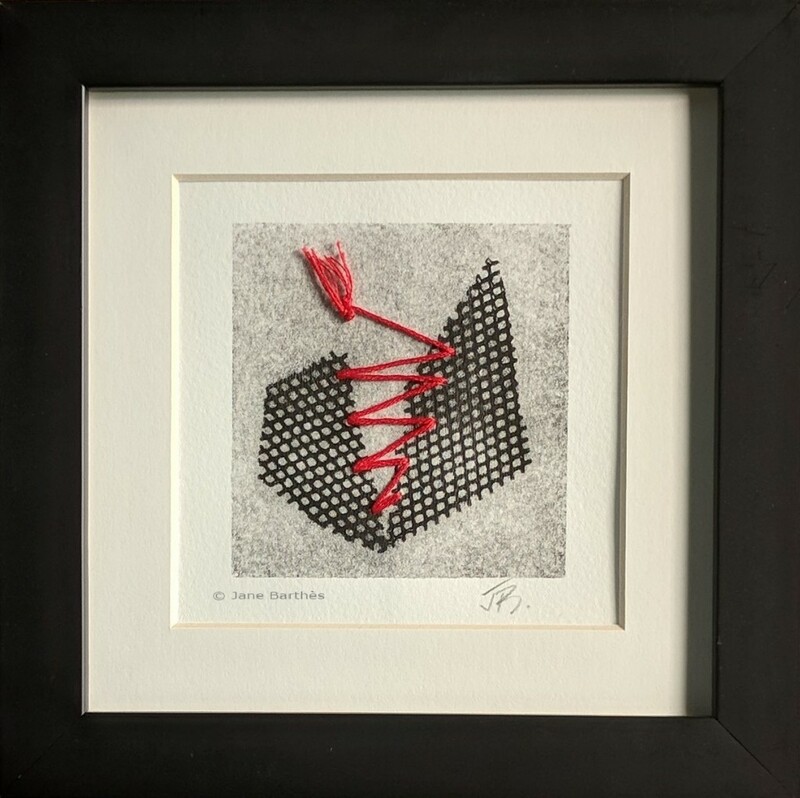 The main body of her work is focused on vast geometric abstracts which explore these ideas in complex and dynamic narratives powered by colour and shape. Her process is rooted in a deeply meditative style and impelled by an energy that is at once explosive and eminently calm. 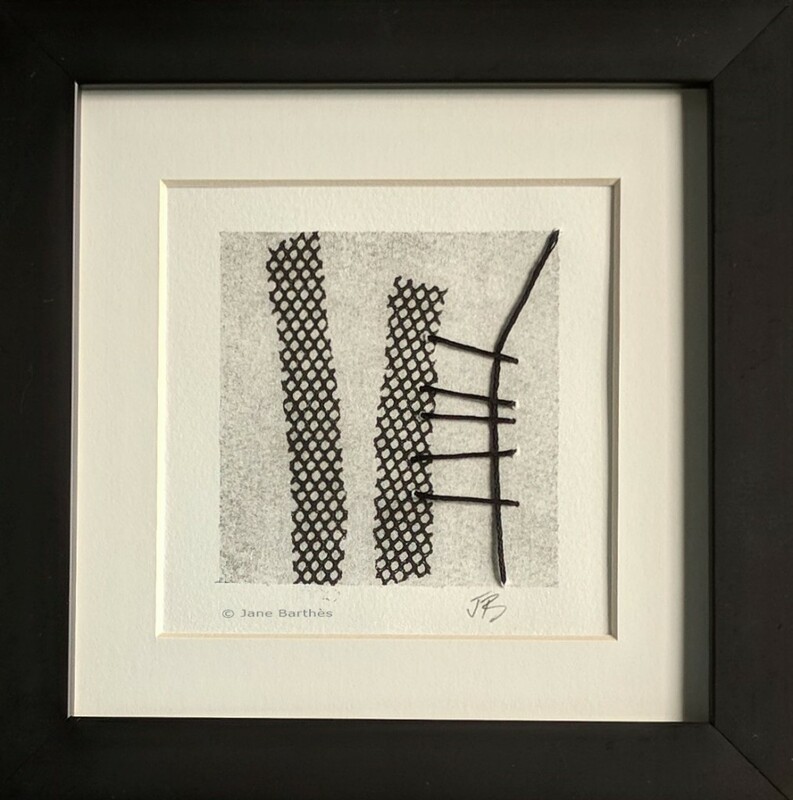 The stitched monotype prints which we’re featuring on this page are created on Somerset paper using water-based inks. 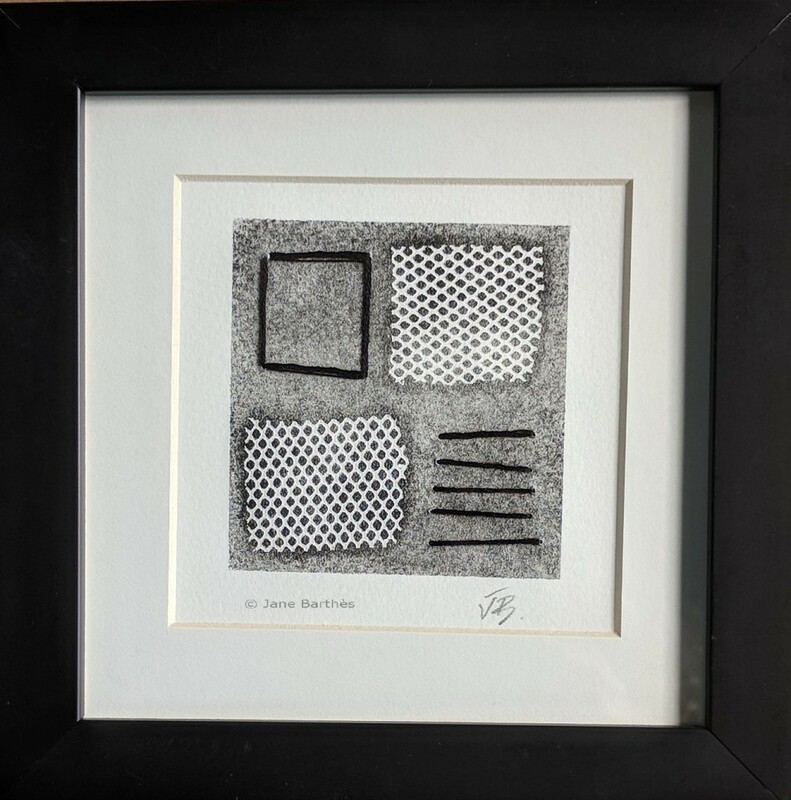 Jane uses textile shapes laid over the inked plate to create a mix of ‘ghost prints’ (grey backgrounds) and black backgrounds, experimenting with various layers and densities of ink to create unique works. Once the paper is dry, she sews into the prints with cotton yarn and a needle. 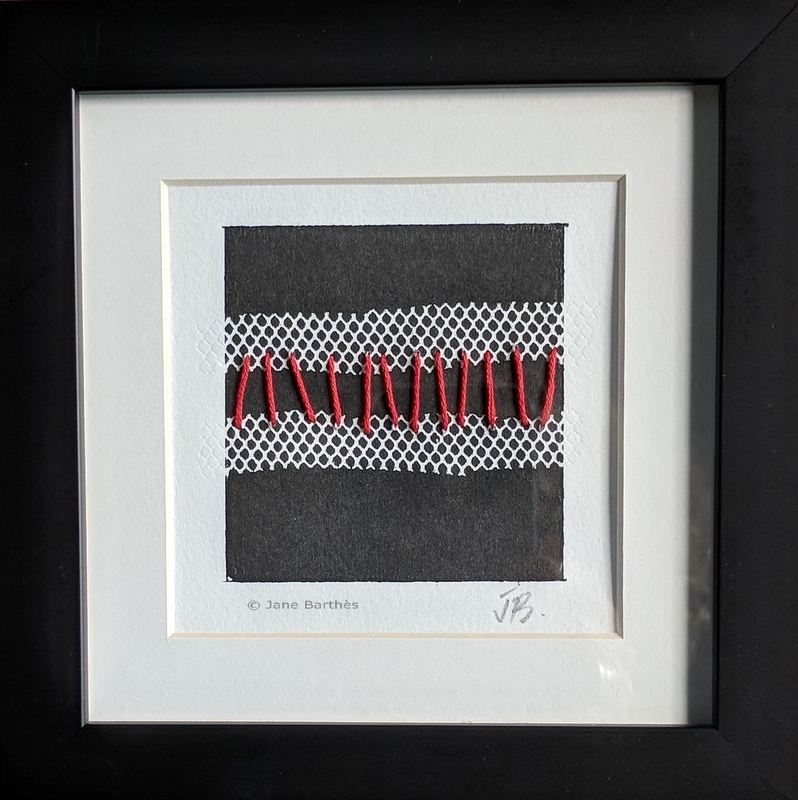 Responding to our questions about the methodology behind the hand stitched artworks and their relationship to larger pieces, Jane said: “I think of this as a form of drawing. It gives a materiality to the work that a pen or pencil wouldn’t. I started with these small individual prints but I’ve since taken the process into larger works on paper and even into some canvas pieces. I’ve enjoyed discovering that I can work in the extremes (large and very small – there are some in-betweens too…) and I enjoy how one feeds the other. I always feel that I don’t fit on a small piece of paper but printing allows me to. I suppose my main focus will always be the big work which is getting bigger but I will always create small too. 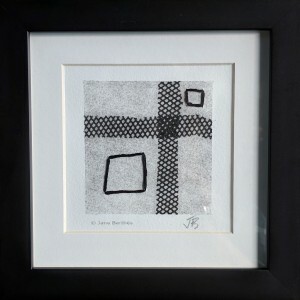 Contact us if you’re interested in her monotype prints – we have a selection of framed works for exhibition and for sale. Prices and shipping costs on request. Check back soon for details of unframed works. Join the mailing list via the link on every page to keep in touch with latest news. You can also connect with us on social media, links are listed on the About Us page. Find out more about Jane and her other works.